AUGUSTA, Ga. (March 8, 2018) – Analysis of the inflammation-promoting proteins in the blood of patients with type 1 diabetes and related kidney disease indicates that the promoters of inflammation are diverse even in the same medical condition and that patients likely would benefit from an anti-inflammatory treatment that directly targets theirs, scientists report. "We all think that prevention of inflammation will help prevent or delay diabetic kidney disease and probably other consequences of type 1 diabetes," says Dr. Jin-Xiong She, director of the Center for Biotechnology and Genomic Medicine at the Medical College of Georgia at Augusta University and Georgia Research Alliance Eminent Scholar in Genomic Medicine. "But not all inflammation is the same and not all patients have the same inflammation, even patients with the same condition like type 1 diabetes," says She, corresponding author of the study in the journal Frontiers in Immunology. "From a prevention or therapeutic point of view, you really have to know what are the primary inflammatory mediators that are increased in a given patient so you can target those. That is really predictive, preventive personalized medicine and that is exactly what we are trying to enable," She says. Chronically high levels of glucose in type 1 diabetes appear to get the attention of the immune system, resulting in chronic inflammation that can destroy organs, nerves and blood vessels. So the MCG scientists looked at blood levels of a dozen mediators of inflammation in 89 patients with diabetes-related kidney disease as well as 483 patients without the kidney problems. The mediators' presence in the bloodstream indicate they might be having an impact body-wide. Previous studies in similar patients have assessed one or only a handful of these mediators. The new, more comprehensive assessment of a dozen mediators, found 10 were elevated in patients who had related kidney damage. But it was these proteins in the TNF-alpha family and IL-6 that were significantly elevated in 40 percent of these patients, compared to those with well-functioning kidneys. Another 40 percent of patients had moderately elevated levels of these mediators, indicating that they might not be the strongest treatment target for that second group, She says. 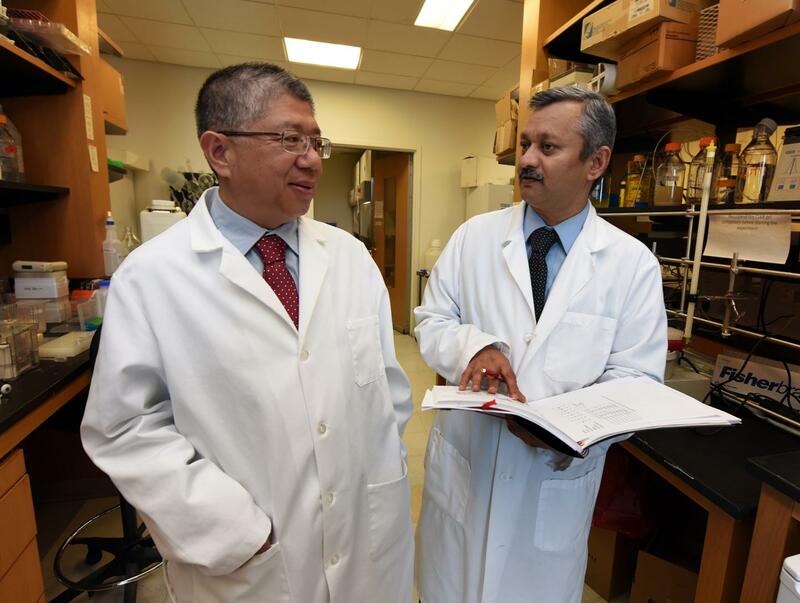 Blood levels of these inflammatory mediators may also provide biomarkers for predicting who has or who will likely get diabetes-related kidney disease, says Dr. Sharad Purohit, biochemist in the MCG Center for Biotechnology and Genomic Medicine and the study's first author. They also could help assess the effectiveness of treatment or prevention strategies. Two classic inflammatory markers regularly measured in hospitals, C-reactive protein, or CRP, and serum amyloid A, or SAA, did not appear to be significant players in these patients, Purohit notes. The MCG scientists are already doing a similar mediator analysis in a larger number of type 1 patients and are working with the MCG Department of Family Medicine to also start looking in the blood of patients with type 2 diabetes. The extensive analyses being done by the scientists are not yet available to physicians. The scientists also are pursuing how to best target these mediators, including several nutritional supplements already known for their anti-inflammatory effects. While many anti-inflammatory agents exist, it is largely unknown what specific mediators they target. Diabetes and high blood pressure are the leading causes of kidney failure in the United States, according to the National Kidney Foundation. Type 1 diabetes is an autoimmune disease where the insulin-producing cells of the pancreas are targeted by the patient's immune system. In type 2 diabetes, patients become less sensitive to the insulin they produce so they cannot properly use and store glucose. The research was funded by the National Institutes of Health and the Juvenile Diabetes Research Foundation.